When Leanne Whitesell met Paws & Think’s Executive Director at Woofstock 2013, she was excited to learn of the opportunities the organization could offer for her dog. 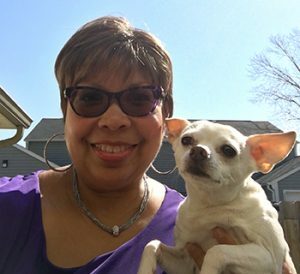 When she got Terrence three years earlier, she knew right away that his gregarious nature and his desire to be around people would make him a great therapy dog, but she struggled to find information about how to accomplish this goal for him. 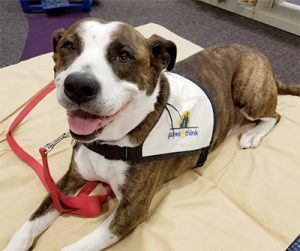 Paws & Think offered a path that made sense, and she says she was drawn to the organization by the friendliness and helpfulness of the staff and volunteers. “They were patient with me and Terrence as we negotiated our way through our new world and allowed Terrence to be himself,” she says. By January of 2014, they were a certified therapy team. In the past three years, Terrence and Leanne have logged 97 therapy visits at 23 different venues. Terrence especially enjoys reading with children, and they regularly visited Eastridge Elementary School, where Leanne remembers two particularly special success stories where Terrance was able to help students improve their reading skills. One third grader improved by three reading levels and said that she believes that reading with Terrence made her enjoy practicing her reading more. Another student worked with Terrence for two years and formed a deep bond with him during their reading time – Terrence would crawl into her lap, and having his undivided attention helped to motivate her. She was the first student in her class to receive the Top Dog trophy for reading ten books. Leanne appreciates that Paws & Think allows her and Terrence to volunteer together, and she feels their work is special because it provides opportunities for many people to engage with therapy dogs who would not otherwise be able to benefit from bonding with an animal. She says that Terrence loves visiting with people and making new friends through Paws & Think. “He is very aware of his responsibilities when he wears his uniform and takes his job very seriously,” she says. Leanne and Terrence have been volunteering at the Indianapolis Public Library – Irvington Branch since June of 2014. 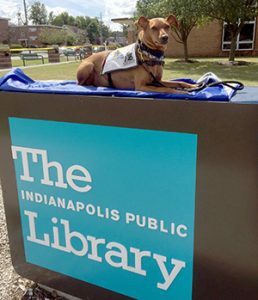 You can stop by to visit them at our Paws to Read program the second Saturday of every month from 11:00am-12:00pm.